The kiwi is a small, round fruit that typically measures about 2 inches in diameter. This fruit has a brown, fuzzy outer layer that protects the soft, green flesh beneath. Kiwis are primarily grown in New Zealand and California, according to the World's Healthiest Foods website. This fruit is a rich source of several important vitamins. 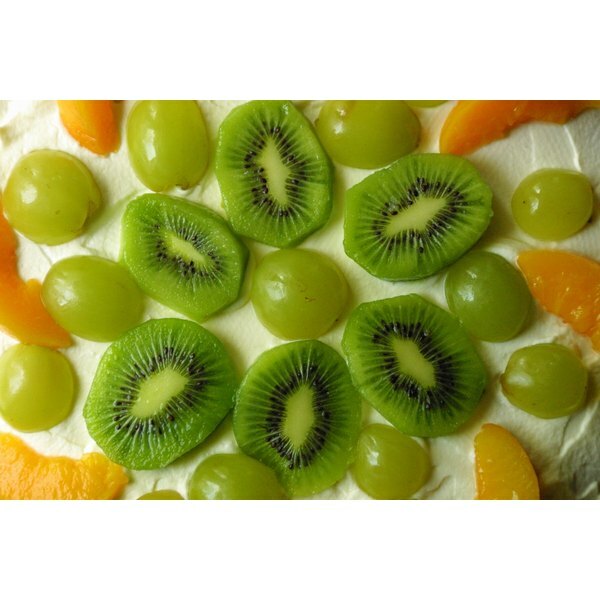 Kiwis are rich in vitamin C. One medium kiwi provides about 95 percent of the recommended daily amount of this vitamin. Vitamin C is an important antioxidant that may protect organ, skin and muscle cells against damage caused by free radical molecules. It is also an essential vitamin for boosting the immune system. Kiwis are also rich sources of vitamin A, according to Michael Murray, author of "The Encyclopedia of Healing Foods." One kiwi provides about 5 percent of the recommended daily intake of vitamin C. Vitamin A may help prevent skin conditions such as acne, according to Dr. James Balch and Phyllis Balch, authors of "Prescription for Nutritional Healing." It also boosts the immune system and may help prevent night blindness. Like vitamin C, vitamin A is an antioxidant. One kiwi fruit provides about 5 percent of the recommended daily intake of vitamin E. This vitamin helps promote proper blood circulation, which aids in the delivery of oxygen and nutrients to organ and muscle tissues, note Dr. James Balch and Phyllis Balch. Vitamin E may also help improve wound healing and minimize scarring. This fat-soluble vitamin is an antioxidant that may help prevent skin cancer and other types of cancer.